THEY’RE SISTERS. BUT IT WILL TAKE A MIRACLE TO MAKE THEM A FAMILY. Adapted from the novel Don’t Look and It Won’t Hurtby Richard Peck, Allison Anders (Grace of My Heart) whipped up a storm at the 42nd Berlin International Film Festival with her masterfully crafted tale of a young woman trying to find love while struggling to bring up her two daughters. Abandoned by her husband, Nora (Brooke Adams, Invasion of the Body Snatchers, The Stuff) waitresses to keep her head above water while raising two teenagers in a small New Mexico town trailer park. Beautiful and rebellious, Trudi (Ione Skye, Wayne’s World, Zodiac) quits school to work alongside her mother, while her sister Shade (Fairuza Balk, The Craft, American History X) whittles away her time watching old movie matinees. Their life is turned on its head when Trudi finds that she has fallen pregnant after a string of promiscuous relationships and the girls' absent father returns with hopes of mending the relationships he broke when he left. 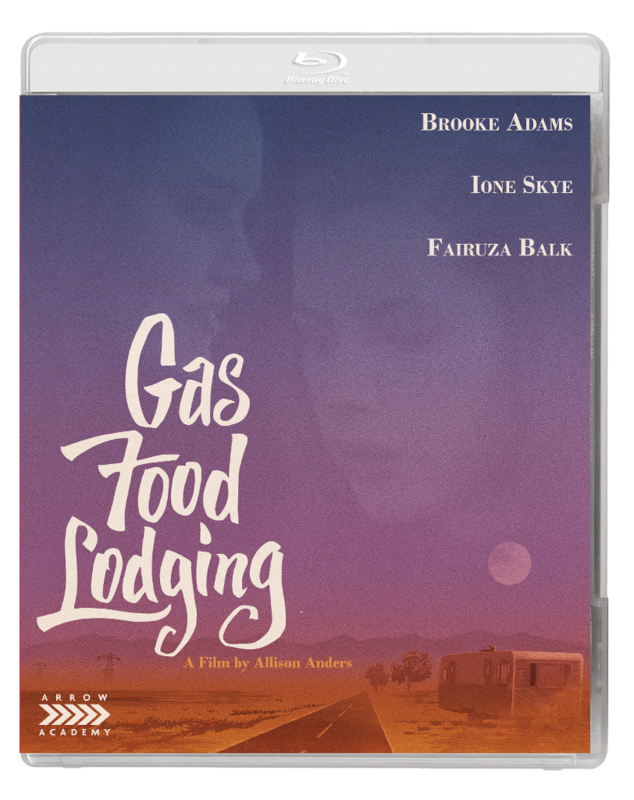 A wonderfully engaging story of the woes of teenagers reaching adulthood, Gas Food Lodgingis a distinctly American portrayal of a mother trying to raise two wayward teens with growing pains, who are learning about love, life and each other. This director-approved restoration finally affords this 90s modern classic the home video treatment it rightly deserves. Smithers! Release the Border Radio jokes! This actually doesn't sound terrible, though. Am I mistaken? Will I regret watching this like we all regret even having looked at the cover of Border Radio? Has anyone seen this one? Sounds interesting. It got good reviews when it opened and I'm sure there was an article in Sight & Sound about it. I seem to remember really liking it when it first turned up on TV a couple of years later, but that's going back a bit. I remember loving Gas Food Lodging (but bear in mind I quite enjoyed Border Radio too! ), but I'm afraid it has been too long since seeing it to remember the details unfortunately. Last edited by colinr0380 on Sat Oct 06, 2018 4:25 pm, edited 1 time in total. I'm still unreasonably bitter about this film despite never having seen it due to this terrible decision. On release I found this to be a very generic 90s indie, inoffensive but unexceptional (I actually prefer Border Radio). The best Anders film I've seen, by a country mile, is Grace of My Heart: fine acting, great subject, fantastic soundtrack - with the sore-thumb exception of Dinosaur Jr.'s contributions, which are complete failures as Beach Boys soundalikes. I suppose loyalty is a virtue, but there are artists who can do the Beach Boys in their sleep, so why couldn't she have given XTC, or Teenage Fanclub, or the High Llamas a call? Now that we know more about the film's background, Grace of My Heart would have made for a very topical release. I haven't seen this since it was released but I loved it then. Of course some of it may be that I just especially appreciate the cast. But its portrait of this milieu, this community, seemed astute and convincingly detailed as well as sympathetic. Anyway, it resonated with me; that's all I can say at this point. The other thing that this release makes me hope for is that the next film by Anders that has really fallen into obscurity, 1993's Mi Vida Loca, might turn up at some point.